It’s probably fair to say that 1766 Bar & Kitchen has been one of the biggest new openings of the second half of 2018. 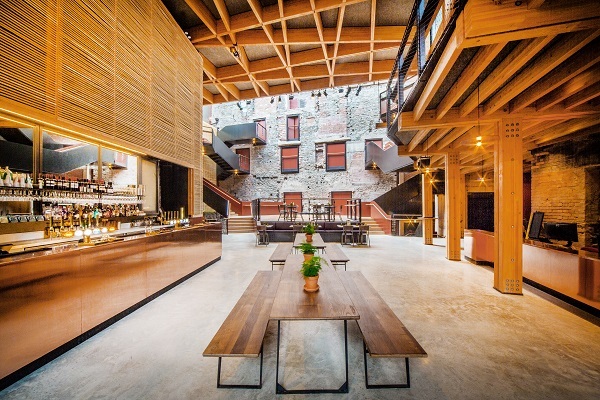 After a significant amount of time, work and investment, the bar and restaurant at the Bristol Old Vic was unveiled to the public in late September, serving everything from morning coffees and brunch to evening meals and cocktails. And it’s a beautiful place: huge windows overlooking King Street and a ridiculously high ceiling give 1766 Bar & Kitchen a really light and airy feel, although it feels slightly strange walking into a room where you have the ticket office on the right, the bar on the left and a dining space that feels very sparsely laid out…until the interval or the end of a show, when it feels way too busy. We weren’t there for a show, though: just to try out the theatre dinner menu, at the surprisingly low price of £19.95 a head for three courses. And it’s a menu that head chef Coco has peppered with British influences (think pork scratchings pre-meal, steak with braised baby gem, and sticky toffee pudding), as well as Oriental-inspired dishes, Spanish charcuterie, affogato on the dessert menu and more, to appeal to all tastes. 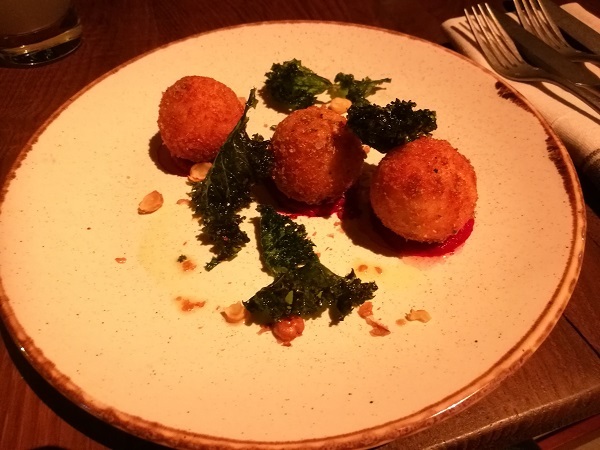 I started with deep fried ewes curd, kale and beetroot – and I chose well. The shell of the curd bonbons was super delicate, giving way to a smooth and tangy curd, the saltiness of which paired perfectly with the earthy sweet beetroot purée underneath. The kale was just salty enough – although a little too oily – and the texture of the chopped hazelnuts was a welcome addition. 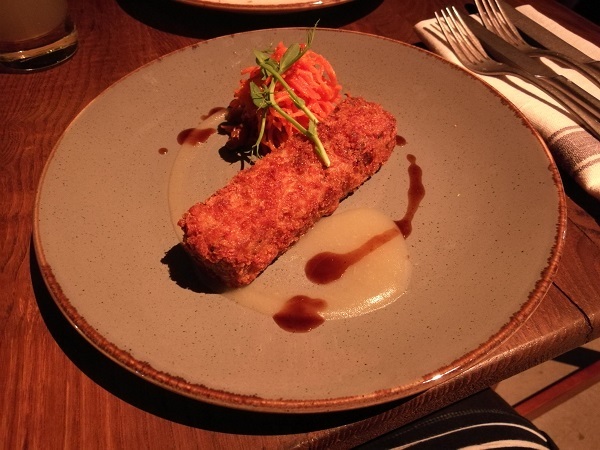 Chris’ pork croquette was a triumph: a light, thin and crispy coating giving way to tender, juicy pork with a rillette-like consistency. 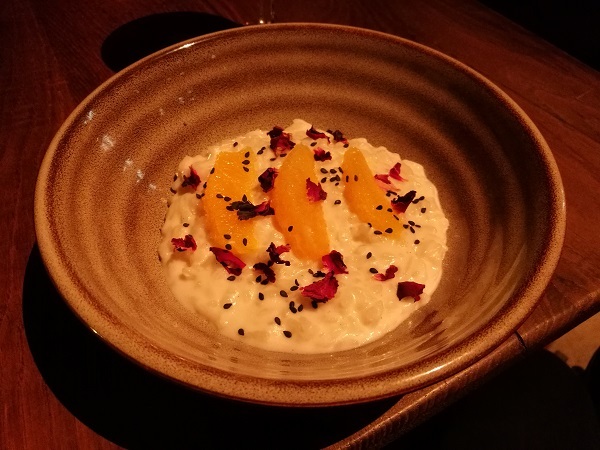 The carrot and sultana salad was sweet and citrusy, while the apple sauce also had plenty of sweetness – it could have done with being a little more tart, but it was delicious. 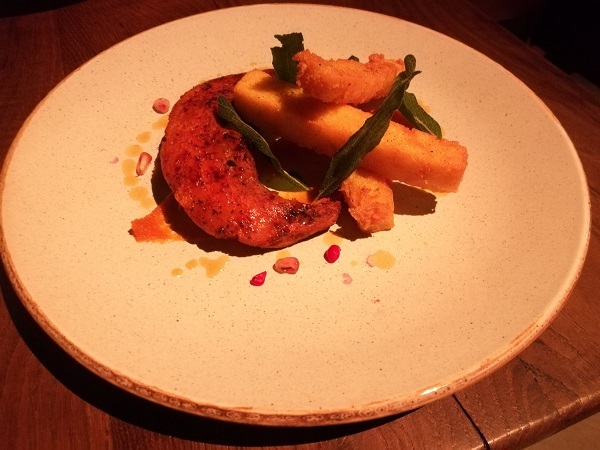 I’m by no means vegetarian, but I’ll sometimes order a veggie option from a meat-heavy menu if it looks interesting enough…and the spiced roast pumpkin with crispy polenta and sage and an orange dressing intrigued me. Beautiful presentation again: a crescent of super-tender pumpkin was brought to life with Indian-style spices, and sat on a smear of sweet pumpkin purée. Sage is a classic pairing for members of the squash family, but it could have been a little crispier…but the polenta chips were great: crispy on the outside and still lovely and tender in the middle. The orange dressing was a little thin and there wasn’t much of it, just the occasional tang every few mouthfuls. And I totally understand the addition of pomegranate jewels – especially with the spices on the pumpkin – but they looked a little anaemic. For Chris, a beautifully cooked 28-day dry aged 170g sirloin of Hereford beef, perfectly medium rare as he’d asked for. 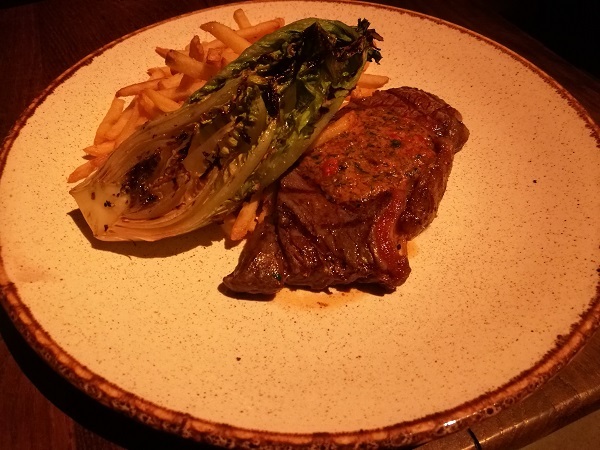 The accompanying thin cut chips were nicely seasoned, and it’s always good to see charred baby gem lettuce on the menu as it’s a favourite of ours – this one was still lovely and juicy but a touch too salty. The real star of the show was the Beurre 1766: 1766’s take on a café de Paris butter whose complex umami flavours came from confit garlic, herbs, sun-dried tomatoes, sherry vinegar and PLENTY more ingredients that it would probably take an entire new post to list. 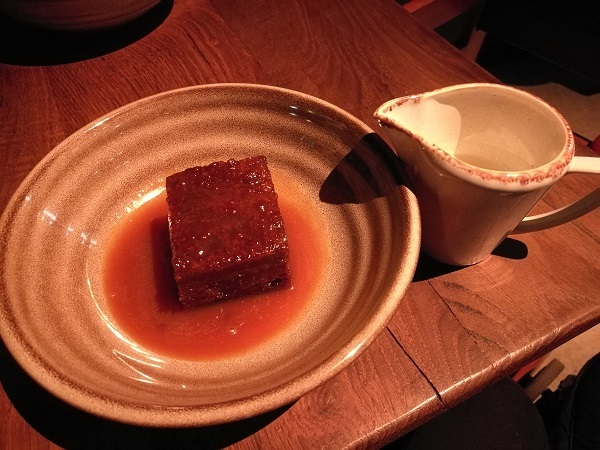 Chris ended his meal with one of the naughtiest of desserts: sticky toffee pudding with butterscotch sauce and double cream. It’s not a dessert I’ll often order: I find it too heavy and too rich. This, though – this was perfectly balanced: a light and delicate sponge, with all the richness coming from its decadent, treacly sauce. The cream? He didn’t touch it – it just wasn’t needed. At the end of the night, we left a substantial tip for our server, Martin – it was only his second shift at 1766, but he clearly knew the menu inside out, he was forthcoming with recommendations, he was friendly and judged his tone carefully, and he interacted with and acknowledged our 8-month old throughout the night – he was an absolute star, and a massive credit to the 1766 team. Please note: our meal at 1766 Bar & Kitchen was received free of charge, but this in no way impacted on our opinion. We were not obliged to write a positive review, and the venue did not see this review before it was put up on the site.